This is photo is a couple of years old, but I like it. It reminds me of why I love being here in Hartsville and at Coker. Finn and I were joggling on the front porch of the Hart House (the oldest house in Hartsville) while dozens of friends (mostly faculty) inside and out on the porch were visiting. It was noisy, but not crazy, just fun. Ted Shaker, an award-wining journalist and television producer and one of the nicest, funniest, smartest people I know, was here to give the commencement address. I had baked my head off for the party. Pies, cakes, cheesecakes, bars, etc., and had assorted munchies (even a smattering of veggies and nuts). I wanted everyone to be impressed. But I also needed to attend the formal Commencement Dinner that evening, so setting up a dessert reception in a different building a couple of miles from campus was “challenging.” Okay, impossible for me. What I did was take car-loads of supplies in a mishmash of cardboard boxes and Tupperware over to the Hart House early in the day, and I asked Mary Ridgeway to set it out for me that evening. I didn’t know how any of it would turn out. I didn’t know if anyone would show up (I don’t believe in RSVPs). It was a late occasion the night before an early event. Complicating things was the fact that at the end of the semester more than a few of us are exhausted. That night, the dinner at the president’s home was soooo much fun. Ted told stories about professional sports and behind-the-scenes personalities. Our Cobras’ baseball team was winning on the road (on its way, as it turned out, to the NCAA Championships for the first time in the College’s history) and we were getting internet-supplied updates throughout the night. It was so enjoyable that I was forgetting my worries about the dessert reception, which was in the hands of my exhausted friends. But after dinner, when we admitted to ourselves that we needed to leave one event to go to the next, I started to become more anxious. Would anyone show up at the Hart House? Would the food be enough? Would it be attractive? As we rounded the corner of Kalmia’s drive, my fears evaporated, at least where the turnout was concerned. The parking area was nearly full. We had dozens of cars. It made me feel great. My friends came! But when I got inside being happy turned to being thrilled. Not only had dozens of friends arrived, inside the house they were laughing and eating and looking beautiful. And Mary had turned piles of baked goods into an elegant spread. Any who know me will attest that “elegant” is not in my DNA. But Mary knew the setting — that fabulous old house — and she knew the guests — Coker’s and Hartsville’s finest — and she knew how to work hard. She worked magic that night and I received the blessings. Finn and I had fun being silly that evening on the joggling board, and the burdens of a year’s work had been transformed into old fashioned joy. 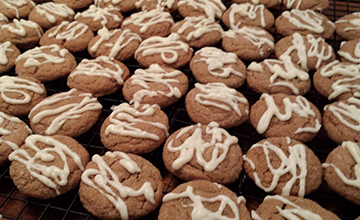 Today, to celebrate Finn and Julia and Cathy being back in town and the College being in full swing, I’ve made molasses crinkles (their favorites and mine) drizzled with white chocolate.